On 2 October, 2012, I had the enjoyable experience of leading a discussion on the subject of student blogging as part of a workshop run under the auspices of the Research Group for Electronic Textuality and Theory; my colleague from the Department of Philosophy, Samantha Brennan, led a parallel discussion on the subject of research blogging, upon which subject she has recently contributed a post here. The workshop concluded with a walk-through and practicum on setting up a WordPress blog. The workshop as a whole was stimulating, instructive, and, really, just a great deal of fun. And I learned much myself from comments and questions contributed by participants. What follows is a somewhat expanded version of that portion of the workshop devoted to instructional blogging. “Social reading” has become something of a buzz term in some quarters. (For some possible approaches to this term, see Bob Stein’s A Taxonomy of Social Reading: a proposal, developed for the “Institute for the Future of the Book.”) It is generally treated as a pedagogical methodology, and associated with things like “peer instruction,” the theory that students learn best when they are actively collaborating together in the learning process, effectively teaching each other rather than merely passively absorbing information. For me, though, “social reading” has a more historically-contingent resonance. After all, reading has historically had a “social” dimension that was somewhat lost in a post-Romantic view of textuality, and that, arguably, online textuality is now in the process of reviving. Social reading, in my view, is therefore not merely a pedagogical strategy for absorbing what has been read, but a window into a different kind of reading that transforms content, making texts multivoiced and multivalent in ways that are simply inaccessible through other more solitary forms of textual engagement. There are a number of approaches that I have adopted to encourage this idea of social reading in ENG1020E; some of these, and a more detailed account of what I am trying to do in the course, I may discuss in a future blog post. In the meantime, it is sufficient to note that student blogging is one of the more important elements of my overall strategy. The essential idea is this: students will write about their texts on public online blogs that were “linked” to each other through subscriptions and blogrolls. They would focus upon their more personal responses to these texts, and would be able to follow what their fellow students thought and said about these same texts in a way that would, hopefully, enlarge their thinking and perspective upon them. 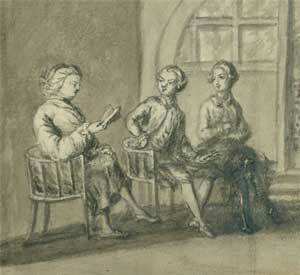 These networked blogs would, in this way, come to constitute another kind of online conversation about literature. This assignment requires each student to create and maintain a “commonplace” blog (probably on WordPress, a free and open blogging site available online). 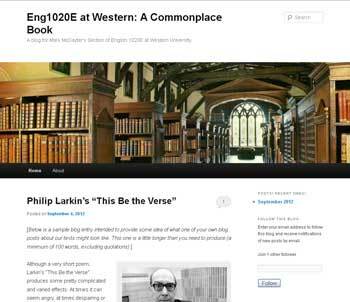 Students will use this blog as a kind of “commonplace book,” a place to record particularly interesting, worthwhile, or important information gleaned from readings, lecture, and tutorial, as well as a few salient lines, phrases, or passages that you think might be useful to remember. Students are expected to produce one blog entry every two weeks of the course, beginning the week of September 24 – September 28. For practical purposes, you will be writing at least 11 blog entries. You may, of course, write more if you wish. Each entry should be a minimum of 100 words, excluding quotes from texts. The blog posts need not be written in an “academic” style — blog writing is generally fairly informal — but they should at least be grammatically correct, and they should relate to a text we have recently read and discussed. 1) To help the student identify salient, interesting, or important information discussed in the course. 2) To provide a handy “study guide” for the first term test and final exam. In addition, students will be encouraged — and would be well advised — to “follow” the blogs of other students in your tutorial section, and even comment on them. You can learn a great deal from this kind of online “discussion.” Note, however, that the usual sanctions against plagiarism count: do not merely copy the blogs of others, although you may link to them..
On occasion, I will be visiting your blogs and commenting on them where useful. I thought this sufficiently clear, detailed, and prescriptive. Oops. Well, I was wrong. Shortly after sending out this rubric, I had a brief but informative discussion with Dr. Elan Paulson, who in her capacity as Digital Communications Specialist at the Faculty of Education here at Western knows a great deal about educational blogging, and has herself used blogs in courses before. Dr. Paulson’s comments made me all too aware of my failure to think through all of the implications of the assignment; her questions caught me frankly off-guard (although they shouldn’t have). How, she asked, will these “commonplace blogs” differ from conventional class journals? How have you addressed the “public” nature of blogging? Will students be instructed in the value and importance of “tagging” posts, or blogrolls? What criteria will be used to evaluate these? My attempts to formulate coherent responses to these questions coincided with an unexpected call to talk about instructional blogging in a workshop that I had organized for faculty and graduate students in the Faculty of Arts and Humanities at Western. Suddenly, I had two compelling reasons to think, and write, a bit more cogently and comprehensively on the subject of student blogging. What appears below, then, is my attempt to do just this. In addition to a more elaborate version of the slide presentation that I gave on student blogs, it includes the “criteria sheet” for the blogging assignment that I eventually produced for my students and teaching assistants: this last appears at the bottom of the post. So, an important caveat: what follows here is not the advice of a seasoned veteran of instructional blogging. On the contrary, it represents the first stumbling attempts of a n00b in the field to systematize his thinking on that subject. It has been informed by some reasonably wide reading, some very helpful conversations, and a good deal of thought, but it has yet to face the trial by fire of actual classroom use. Treat it, accordingly, with some caution. In addition, those interested in this subject should check out Instructional Blogging: Links and Resources, a list of online and print discussions that I assembled in advance of the workshop a few weeks ago; to an important degree, that list can be treated as a supplement to the list of references here, as the resources and articles given there have greatly informed my understanding of this subject. A good place to start is, perhaps, by asking oneself some basic questions about the intended function of the blogging exercise and the desired learning outcomes. What is the function of the blogs? This is obviously pretty fundamental. The first part of the answer should focus upon the ways in which blogs will enable learning. How will this exercise “teach” your students, and what will it teach them? The second half of the question should relate to the choice of medium. Presumably, you are using blogs, rather than (for instance) course journals for a particular reason. What is it that blogs have to offer that other media, traditional or not, do not? Do those learning outcomes rely upon the kinds of features that blogs offer, or are they enhanced by them? A number of things attracted me to the idea of student blogging. Blogs provide students with their own secure textual “space” within which to express themselves, while simultaneously allowing others to comment and contribute. The exercise would also help train students to write in a more self-aware way for public online consumption, a skill that, in my capacity as a digital humanist, I also thought well worth their time to cultivate. How do they relate to other course content? This question relates most obviously, perhaps, to the issue of content. What will students be writing here, and how does it relate to what you are teaching? Will this be a place to focus on texts? Upon secondary source readings? Upon lecture or tutorial material? Upon their own responses to course content? Given that blogs have developed as a form well suited for “thinking out loud” (remember the etymology of the term “blog” comes from “web log”), they are probably not ideal as a place to keep lecture notes, but are rather better suited for the kind of intellectual explorations of texts and ideas that characterized the older notion of the informal personal “essay” as practised by Montaigne, Bacon, and others. The issue of form is again important: to what degree is your evaluation going to focus upon the blog as a medium? In other words, is part of the mark for their blogs going to be based upon an evaluation of the degree to which the student has mastered blog-writing as a discrete genre, just as part of the grade (and usually a substantial part, at that) for an essay is likely to derive from a demonstrated competence in essay writing? The exact criteria that you choose will, of course, depend greatly upon your answer to other questions here, as for example the relation to course content and the function of the blogs. What is particularly important, however, is that these criteria be reasonably clear to the students. Remember that while they will likely have written formal essays for grading before, and so will already have some sense of the types of criteria used to evaluate these, there is a good chance that they’ve never been evaluated for blog writing. Their sense of what constitutes a “good” blog post will be accordingly much fuzzier. Blogging is almost by definition a public exercise, but most blogging apps (including WordPress) permit blog content to be kept hidden from the general public. The choice of “public” or “private” will depend, again, to a great degree upon what one sees as the function of the blog. Remember, too, that the content, tone, and style of the blog post may — indeed, should — vary according to the degree to which it is public. Writing for one’s peers, instructor, or teaching assistants is not the same thing as writing for a more general and diverse audience. To what degree are these blogs to be written by each student in isolation of the others? Or will you have them use the blogging tools available — reblogging, blogrolls, and “follow” buttons — so that they are writing within and for a larger community of their colleagues? Making a blog public does not, in and of itself, ensure that students are accessing, and gaining the benefit of, each other’s blogs. Of course, you may not want them to do this — but if not, then perhaps it is worth asking, again, whether blogging is really a worthwhile exercise in the first place. How will feedback and comments be handled? Are you planning to interact directly and publicly with the student blogs? If so, what sort of “voice” will you use, and how will you handle critical comments and suggestions? Will you “correct” a student when she or he gets something wrong? Receiving public criticism on a blog can be traumatic enough; it is doubly so when it is coming from your instructor or teaching assistant. There are also, of course, issues of “confidentiality,” as the blog will presumably be a graded assignment: how can you provide feedback and commentary in such a way as not to breach confidentiality? How one answers these questions will, of course, go a long way to determining the sorts of blogs that your students produce, as well as your own evaluation of them. There are, however, additional aspects of blogs in general that need to be considered before finalizing a student blogging assignment. Many of these factors for consideration will relate in obvious ways to some of the questions I’ve asked above. I am certain that there are others I have not thought of or included here; doubtless some of these will occur to me as the year, and the students’ actual work at blogging, unfolds. Take advantage of the online venue: if the blog makes use of none of the features that the online medium makes available, such as enabled comments, hyperlinks, or “follow” features, then there is perhaps little point in using it instead of, say, e-mail. Bear in mind that blogs are not essays, and should likely be written in a very different (and probably more personal) voice. Citation is (usually) handled differently on blogs, often just with links to online versions of the source. Actually, however, there is nothing really to prevent one from using MLA, Chicago, or APA citation style in a blog piece, and some blog writers (including myself) do so. If the blog posts are intended to be more essay-like, then employing conventional citation probably makes sense. Blogs can employ “tags” to increase online visibility; if one of the points of the exercise is to not merely produce a blog, but actually to teach about blogging, then guiding students in the use of metadata such as tags is important. Blogrolls and subscriptions can turn isolated blogs into networks. Again, an important function of the online medium is to turn a one-to-one conversation (between, say, student and instructor) into a multi-voiced online discussion. Having your students use blogrolls and install “Follow” widgets (which enable e-mail subscriptions to a blog) effectively “networks” the blogs in a way that permits students to learn from each other in an asynchronous manner that will not be unfamiliar to them from Facebook and other forms of social media. Blogs are most usually and naturally a form of “public writing.” There are hazards to asking students to publish their thoughts online; perhaps the most important of these is that it exposes them to trolls and flaming. On the other hand, almost all students are producing writing that is more-or-less public already — on Facebook, Tumblr, or Twitter. Using a blogging exercise to talk about the differences between public discourse and private communication is probably a pretty useful thing. IP and Reproduction Rights are generally not handled well in most social media, including blogs. This is perhaps a good opportunity to talk about what these things are, and why it may not be a great idea to simply paste that cool image from someone’s web page into your own blog without permission or acknowledgement. 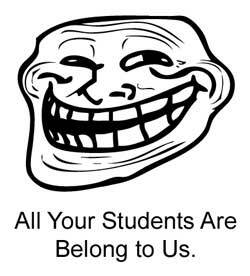 Flaming and Trolling are endemic online, and there is some chance, particularly if students are writing about a controversial or contentious issue, that their posts will show up in someone’s Google search, and they will find themselves the target of a bit of online nastiness. Students can, of course, be insulated from this possibility by changing blog privacy settings — but it can be argued that it is far more valuable to instruct them instead on how to deal with this not uncommon pitfall of online writing should it arise. Students are, as I’ve noted, already living online; they are already vulnerable to various forms of cyberbullying. Learning to deal with it is an important component of learning how to communicate online. The criteria by which your blogs will be evaluated fall into three categories: Primary Criteria, Secondary Criteria, and Optional “Extras.” The latter category consists of features that are not absolutely required, but that will gain you some extra credit if included. The grade percentages associated with each of these criteria are guidelines only, and represent the relative “weight” of each category that we’ll be using when evaluating your blogs. In an instance in which, for example, the “content” of the blog posts is exceptional, we may feel justified in boosting the mark for that above the 40% allowed for below. Content (40%) – “Content” in this context means the degree to which your posts focus upon one of our class texts, and the “quality” of your insights and thoughts about those texts. Remember that the point of the blog is not to regurgitate material from lectures and tutorials (although you may of course refer to these), but rather to add your own thoughts and impressions about these poems, novels, plays, and essays. A high quality post will engage with a text both critically (that is to say, will feature some original insights that come from a considered reading of it) and personally. You needn’t be afraid of being “wrong” in any of your discussions, but your impressions and ideas should be backed up with at least some “evidence” from the text. As well, your posts should be to some degree “original,” a requirement that is implied by the fact that they are also “personal” responses. Merely parroting the remarks or thoughts of other students will result in a loss of marks. Grammar and Spelling (10%) – As noted above, a blog is not a formal essay. That said, you are still writing to be understood, and for an audience (even if it is only your TA and instructor), and your writing should therefore be grammatically correct. Occasional liberties (for instance, the occasional sentence fragment for dramatic or rhetorical effect) are permissible, but posts littered with grammatical errors and spelling mistakes will be penalized. Timeliness and Length (10%) – The rubric for the blogging assignment specifies that you are expected to write “one blog entry every two weeks of the course, beginning the week of September 24 – September 28.” It also requires that each entry be a minimum of 100 words, excluding quotes from texts. There will be some flexibility on the first requirement: we won’t be counting down to midnight on the last night of each two-week period to check that you have produced a blog post within that interval. But you are expected to “keep up,” and should post your bi-weekly entries no more than a day or two late. Do not wait until the end of the term or the course to post a backlog of entries: this would defeat one of the main points of the exercise, and will result in the deduction of marks. Citation (5%) – Most blogs “cite” sources by linking to them, if they are online, and otherwise provide no more than an author, title, and perhaps date integrated into the discussion itself. This approach is acceptable, but you can also, if you wish, provide more formal citations at the end of each post. Do be sure, however, to provide some citation for ideas and quotes taken from elsewhere, especially if they are from a fellow student. Comments – You can earn some extra credit (up to 5%) by commenting on the blogs of other students within your tutorial group. These needn’t be lengthy or elaborate, but should be more than a wave: try to say something substantive about the post upon which you are commenting. And, of course, please be civil and respectful of the opinions and writing of others. Multimedia, Images, and Links – You can additionally earn some additional credit (up to 5%) by integrating into your blog post some images, multimedia, and links. These must, of course, be relevant in some way to your post, although can certainly also be “humorous” or draw connections to popular culture (e.g., music videos and even the occasional pertinent “lolcat”). YouTube videos are usually viewed as being in the public domain, and so can be used without worry, but make sure that the images and other materials you use are also “public.” The easiest place to find images that are in the public domain is Wikimedia Commons; some electronic databases and sources also specify that you can use images so long as the original source is acknowledged and cited. Actually, I don’t have any of these yet. My class is only now entering their third week of this assignment: most of the students have as yet produced only a single post. So far, I’m pretty pleased with these. Students have been using this opportunity to register their personal responses to texts, while also supporting these with at least some textual evidence. The thing that has impressed me most, however, in these early stages of the assignments is how much more than the prescribed 100 words per post students have been writing. This is actually an unlooked-for benefit of the blogs: while the word count for the blogging assignment is included in the overall written requirement for the course, it had not occurred to me that students would actually write more — and in many cases, substantially more — than was required of them. If one of the points of humanities courses in general, and English courses in particular, is to give students practical experience in writing, then student blogging would seem, at least at this early showing, to be a powerful tool. This entry was posted in Resources, Workshops and tagged Academic Technology, Blogs, Bob Stein, Elan Paulson, Facebook, Institute for the Future of the Book, Instructional Technology, Research Group for Electronic Textuality and Theory, Samantha Brennan, social media, Social Reading, Student Blogs, Workshops. Bookmark the permalink.